Only 16h 28m 33s left! O.k., so for a while I've been living with render times that seemed soooo long to me and I often wondered what I could do to speed things up - without losing much image quality. So I've wasted my Saturday doing the tedious task of altering render settings one variable at a time, one increment/decrement at a time. I'm here to share the fruits of my labor with you all, and more importantly get feedback from you all. Sorry if this ground has been covered before (I'm sure it has), but what the heck. 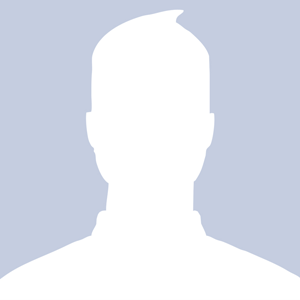 In the test I used one infinite light and one IBL. No shadows on the IBL, the shadow map size for the infinite light is set to 8192, shadow blur radius 2.5, minimum bias 0.10000, (display units in inches). The model I used in the test image was V3, shooting with the face camera, which always seems to take longer (probably because there's more detail in the face than anywhere else). I'm using Face Off's Occlusion Master and Unimesh Realism Kit - so the character itself is bearing Ambient Occlusion nodes. I'm using Robin, a texture by A_ (a beautiful texture in general, but even greater if you're needing a redhead - http://market.renderosity.com/mod/bcs/index.php?ViewProduct=31022), with a body texture map of size 3000x4000 (approx 1.8 MB), a head texture map of size 4000x2720 (approx 2.1 MB). Comparing images it's hard to see much of a difference. The one notable exception is in the area of the eyelashes - you'll notice the render at the compromise settings has eyelashes that are clumpier or less smooth, along with the shadows for the eyelashes. 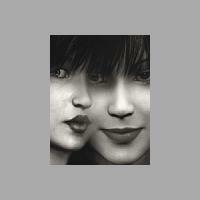 There's also possibly a bit less smoothness in the shadow edges, and perhaps a bit less detail in the lips. For that price, I cut my render time in half, from 10 minutes to 5 minutes. Moving the number of raytrace bounces from 2 to 1 took 1 minute off the render time with no noticeable results - however there's not much reflection or refraction going on here (some in the eyes which I see no difference in), so I don't know if this is the best test of that setting. Moving the min shading rate from 0.50 to 5.00 took 6 minutes off the render time, with noticeable results as the overall image became a bit more grainy, but the results weren't remarkably bad - they could be passable for quick decent quality results. So it appears the largest factor in the quality/time trade off is the shading rate. When I left all the settings from Face Off the same and only moved the shading rate up to 1.0 and the bucket size up to 256 it took 4 minutes off the render (6 minute render time). As bucket size does not affect image quality, it seems to leave the shading rate as the thing which will most greatly determines your render time vs. render quality. As mentioned many times before you'd want to get your bucket size up as large as your system can handle as long as you can live with poser being somewhat less responsive while you render. I think with my compromise settings or a very slight variation thereof I've found a good render setting which will produce quality results in less time. I don't know if this helps anyone but me, but I'd love to hear feedback or have people contribute more information on this - especially if you're not seeing what I'm seeing. I think each point drop (1.00) on the shading rate means your pc has to calculate 100 micropixels. This is where the real damage is. Hair (and eyelashes) suffers the most here when shading rate is high. Poser's scale is about 1/100th the scale of most apps, too. Textures are usually too big for poser to read, hence lowering the shading rate to get more accurate reads.... and the vicious cycle begins. Or,,, Cut the huge hair textures in half along with the tR maps. Leave shading rate at 1.00 or higher. Get clear results. In half the time. Stewer trick. Another time gain is lowering the shadowmap. A map of 3072 I consider huge and reserved for "final only" renders. I've clocked 7 hours for a 3072 spot to render its shadowmap. A map of over 8000 I think, is way more than you need for these tests. Effects are nice, though. No question. 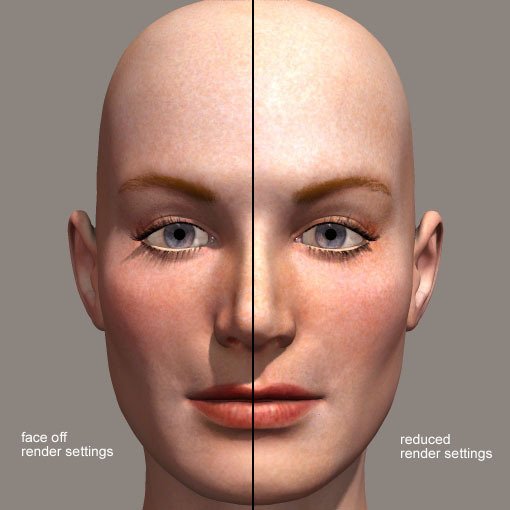 face_off's lightsettings are designed to get RayTrace/like shadows in clarity and shadowmap/like quality in shadow blur and glow or leaked light reduction(ears, nostril, lacs, mouth). I remember his settings as; 3072map, 0.01bias, 10-12 blur along with a few tinted rimlights. The results are really good but, that bias setting is a killer...but neccessary. As far as bucket size, I let P6 decide when it needs to split. I'm always down to 32 before I know it. It really is effective to raise it if you have a "light" scene. On RayTrace bounces... Try to have RayTrace checked but have bounces on 0. This allows AO to function without a wait. Bounces are strickly Reflect/Refract (Imo) so unless you have reflect attached to eyewhites/corneas, you can save some time there, too. And don't forget the body...make invisible whatever is not in the viewer. Big savings in memory. And thanks for the great post. I love this stuff and it kills me when I see some settings people keep crashing with. Cool. I notice that with procedurals, A higher MinShade rate causes the procedural to look larger the further away the camera gets. "Conviction without truth is denial; Denial in the face of truth is concealment." Great post, thanks for all your experimenting and posting your results. Also thanks to richardson, as always, for his great tips. Since we last spoke I looked into some of Richardson's ideas. Firstly I found that since I was using raytraced shadows, the shadow map setting had almost no affect on my renders at all, neither in terms of quality or time of render. I haven't done much with depth mapped shadows since I got Poser 6 - I don't know when I'll look into this. I also found that the shadow blur radius didn't really affect time of render given the other settings I'm using. It definitely changes the resulting render about as you'd expect - a low setting resulted in very tight shadows, a higher setting resulted in very fuzzy dispersed shadows. I found with the settings I have here the higher radius produced unsatisfactory results - too grainy. I believe I'd need to up the shade rate and the pixel samples to produce good quality dispersed (high radius) shadows - which would definitely increase render time. The type of shadow you're going for will determine what you can do here - I generally like the sharper shadows myself, so I'm happy with the low radius settings. 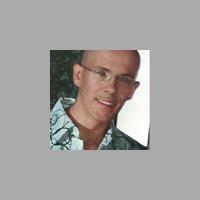 I'm going to look into Richardson's comments about hair and transparency map size soon. I'll report back here with results as I get them. Unzipped, Yes, RayTrace "maps" are really a leftover from P4 or shadowmap lights and serve no purpose. I set them to 256 in case there is a quick memory calc that I can avoid. RayTrace shadows are severe and blur(5-12) does not take care of all of it so, I usually set shadow to 0.400 to help disperse it (on skin). If using a spot you can choke the angle 0start 60end to soften some more. You need an ibl fill in the scene for this... it takes up the slack on the mainlight. 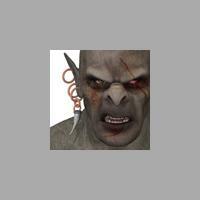 A rimlight can either assist the mainlight or (attached) create a nice highlight (RayT also). With this setup, I can crank out a render every 6-10 minutes with decent results. Granted, not as spectacular as a nice face_off setup but, 10 times quicker. Switching the mainlight to shadowmap/3072 for the final is a nice alternative. So, you were using RayTrace in your tests? That explains the eyelash shadows! Shadowmaps don't do eyelashes too well. Also, before you raise pixel samples or shading rate, try scaling your scene 1000%. I have yet to test this but I'm sure it's a solution for something. RayTrace is strangled at Poser scale. Reflect/Refract/artifacting dissappears at 1000% scale. Ronstuff proved this in P5 on an old thread of mine. Bump and some other shader nodes do not scale with the figure so, a manual job will be needed. 0.01bump becomes 0.100 at scaled version. Worth a look into... When you get to hair, please let me know. Quote - ...RayTrace shadows are severe and blur(5-12) does not take care of all of it so, I usually set shadow to 0.400 to help disperse it (on skin). 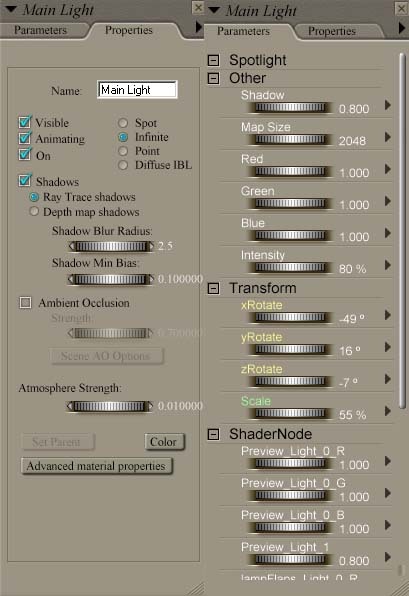 Just to be clear, when you say "set shadow to 0.400" you're talking about the shadow bias - or is it something else? If it's bias I usually start with it at about 0.1 and then adjust it if I'm getting ambient occlusion related artifacts. I usually don't go higher than 1.1 or lower than 0.01 (and very rarely at that), but I've not noticed any render time impact as a result. 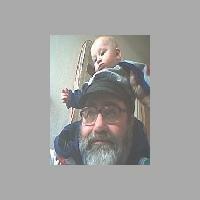 Quote - If using a spot you can choke the angle 0start 60end to soften some more. You need an ibl fill in the scene for this... it takes up the slack on the mainlight. A rimlight can either assist the mainlight or (attached) create a nice highlight (RayT also). With this setup, I can crank out a render every 6-10 minutes with decent results. Granted, not as spectacular as a nice face_off setup but, 10 times quicker. Switching the mainlight to shadowmap/3072 for the final is a nice alternative. I'd be really interested to see your "standard" render settings and light set up - any chance you could post them here? I often find myself wishing there were additional raytrace settings on the lights so that for instance they did only specular and didn't add more actual light to the scene or so they only cast shadows and don't add any light to the scene. Then you could use one ibl for the actual light, one for specular/reflection/refraction and either the same one or a different one for shadows. Maybe there's a setting in there I haven't found or hacked that will allow for that - but I haven't found it yet. Quote - So, you were using RayTrace in your tests? That explains the eyelash shadows! Shadowmaps don't do eyelashes too well. Yeah, I've got my default environment set to load up with just two lights, one infinite and one ibl. I only have shadows enabled for the infinite light - raytraced. I mess around with the intensity of the two depending on what I'm after, but generally the infinite is the main light and the ibl is the fill (I forget which but one of FaceOffs scripts (realism or occlusion) doesn't work with IBL as the more prominent light in the scene). 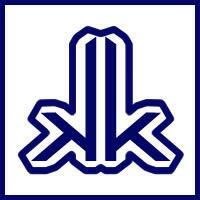 I can do o.k. with those two - it's a workaday arrangement. If I want to get more involved/spectacular I can add lights from there. This is fascinating stuff. 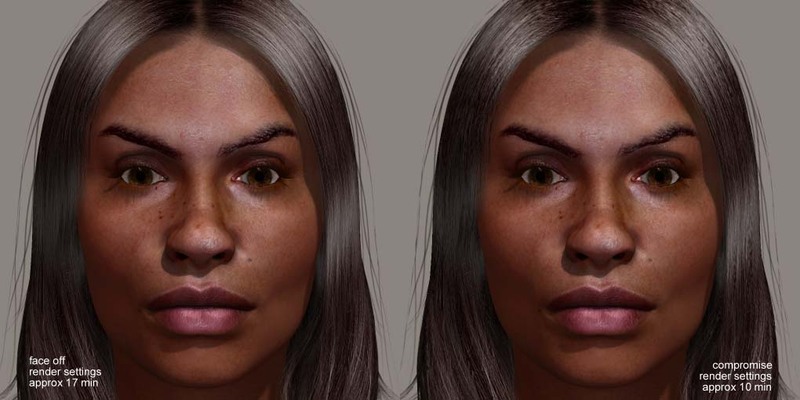 It's amazing how the incredibly bad mistake of what the default Poser scale was set to in the beginning has had such long lasting and numerous negative affects. I'm somewhat loath to do the scaling thing since I'd have to adjust all the cameras, figures, props and everything too, but it might be interesting to see what scaling up can do. Quote - When you get to hair, please let me know. Will do - perhaps this weekend. Just to be clear, when you say "set shadow to 0.400" you're talking about the shadow bias - or is it something else? If it's bias I usually start with it at about 0.1 and then adjust it if I'm getting ambient occlusion related artifacts.." Bias, you want high in RayTrace(like maps, does not seem to do much). @1.00. Lowering the actual shadow intensity is what I meant @0.400 "I often find myself wishing there were additional raytrace settings on the lights so that for instance they did only specular and didn't add more actual light to the scene or so they only cast shadows and don't add any light to the scene". You are in luck! Intensity dials down to negative values in P6 (-2.000). No light,,more shadows. "I'm somewhat loath to do the scaling thing since I'd have to adjust all the cameras, figures, props and everything too".. In luck again! Load a primitive box. In hierachy editor, drag all pertinant matter over the box including your cams and lights you'll use. Check your main cam and then scale box to 1000%. Nothing should change in the viewer. Flippin back to 100% box when you want to compare... Scaling up to 10,000 to 100,000 will solve iris/cornea artifacting, too. I can send you a pz3 with my lightset. It would be more effective. Speaking of IBL,, I've noticed that light base AO should be about 1/10th in settings as material based AO. I've dialed down AO in this lightset. Ahh, now I understand which setting you're talking about. As for bias, as I said I only change it when I notice A/O related artifacts - otherwise it doesn't have much affect. Quote - You are in luck! Intensity dials down to negative values in P6 (-2.000). No light,,more shadows. That's a great tip. Does it work for both depth mapped and ray traced shadows? I assume such a light would still not generate any specular though. Quote - In luck again! Load a primitive box. In hierachy editor, drag all pertinant matter over the box including your cams and lights you'll use. Check your main cam and then scale box to 1000%. Nothing should change in the viewer. Flippin back to 100% box when you want to compare... Scaling up to 10,000 to 100,000 will solve iris/cornea artifacting, too. Now that's good squishy - I can see why we pay you the big bucks. I can't wait to try this out. Quote - I can send you a pz3 with my lightset. It would be more effective. That would be much appreciated! Can an empty pz3 be small enough to send via email? If so you could try sending it to my shulkophile@yahoo.com account. 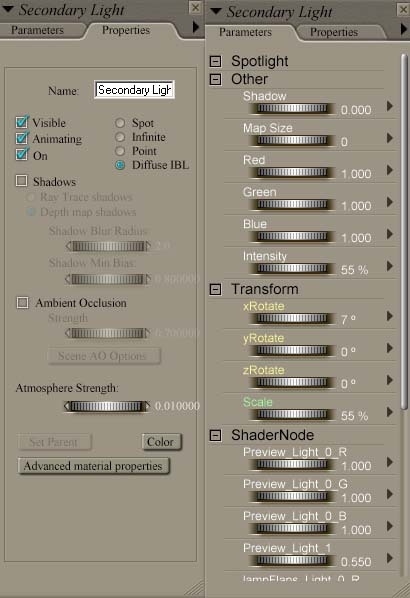 Quote - Speaking of IBL,, I've noticed that light base AO should be about 1/10th in settings as material based AO. I've dialed down AO in this lightset. I've noticed that too. Since I've started using occlusion master, I don't really use light based A/O anymore though. I suppose if I wanted to up the realism a bit more I should turn that on for my IBL, but I don't want to pay the render time price for the extra shadows usually. Great thread. Have to come back and read this again. Bookmark. Thanks unzipped. Very intersting thread. I'm looking forward for the hair comparison. Also, will look if i have some time to do it too, because i made an application to reduce quickly the textures found in a scene. Once i finished my actual render, i will try it. No problem, take all the time you need - I hope your server problem isn't serious. will there be a sort of final render settings post? because i think i've gotten lost on recommendations, other than high bucket size is good. oh, and unzipped, you know you can change the shading rate for each object/group, right? 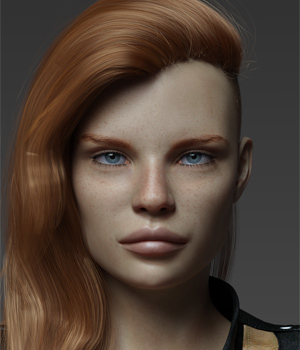 so you can leave the render setting (minimum value) low, boost it up high for things where it doesn't matter and make it low for stuff where it does (like hair, eyelashes, etc.). i mean, i'm betting you know since both you guys seem to be much more knowledgeable than i, but i thought i'd check. Quote - will there be a sort of final render settings post? because i think i've gotten lost on recommendations, other than high bucket size is good. oh, and unzipped, you know you can change the shading rate for each object/group, right? so you can leave the render setting (minimum value) low, boost it up high for things where it doesn't matter and make it low for stuff where it does (like hair, eyelashes, etc.). i mean, i'm betting you know since both you guys seem to be much more knowledgeable than i, but i thought i'd check. I'm trying to work up to "final" render settings - but in truth I don't think there will end up being any such thing. It seems I'm developing a few different settings depending on which compromises I'm willing to make - but I think I'm zeroing in on one that's a good balance of quality and speed. If I manage to get such a setting together I'll definitely post it here. The individual object shading rate is something I knew, but it's something I always forget about - so it's definitely worth mentioning whenever anyone feels like mentioning it, so thanks very much for bringing it up. No I'm just using his render settings - I don't have his light settings. I started with his settings as my high quality baseline to compare against - you've got to have a control in any experiment and his render settings are a known quantity. My lighting setup is the same as it was before (top of post), I'm trying to keep as many things as constant as possible during these tests. So we're using raytraced shadows, not mapped. I picked the Wild Hair because I knew intuitively that it was a beast in terms of render times, and I'm also going to compare it against a more lightweight hair model. Allright I'm about done with this for now. Specs haven't changed from what I've mentioned at the top of this thread (light setup, face_off's shader settings, hardware, etc.). 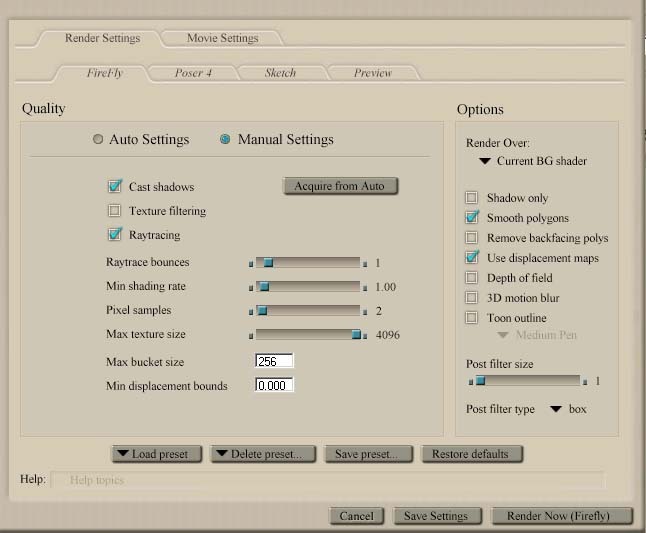 The only thing to note is what I'm calling my compromise render settings which are my attempt to get a good combination of timely renders and good quality images - you'll have to judge the results for yourselves. 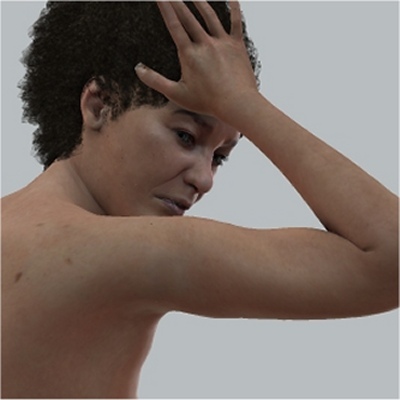 I compared render settings against two different hair models - the Wild Hair (available here in the marketplace - a very realistic hair/materials package) and the Long Hair Evolution (Kozaburo's - gold standard hair). 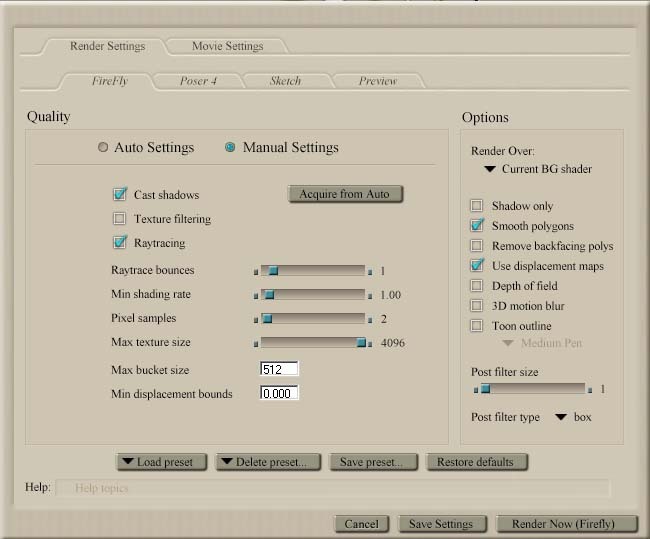 Here are my compromise render settings. Let me say here that I think these are what I'm going to be working with most of the time from now on in my rendering - I'm happy with the quality vs. time results for rendering with the face camera. Here are the settings for my main light. 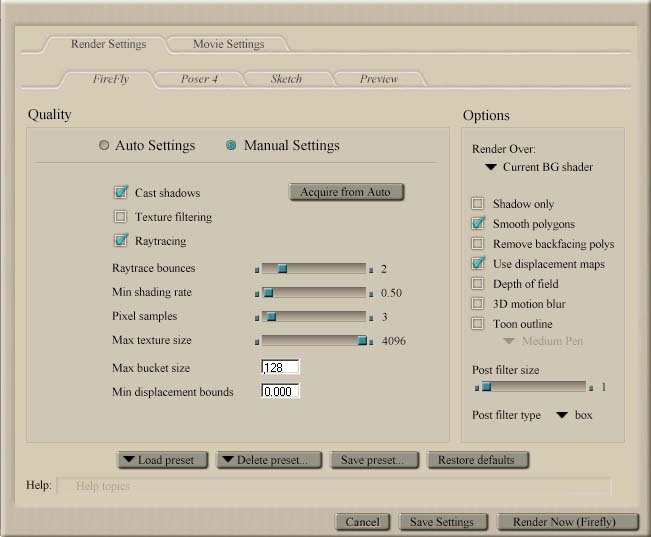 Here are my secondary/fill light settings. These are the only two lights in the scenes. 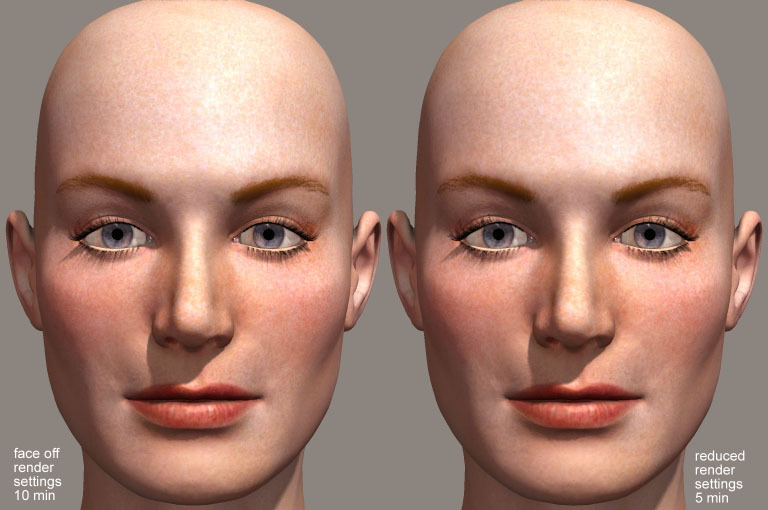 Here's a comparison of rendering the Wild Hair at the different render settings. 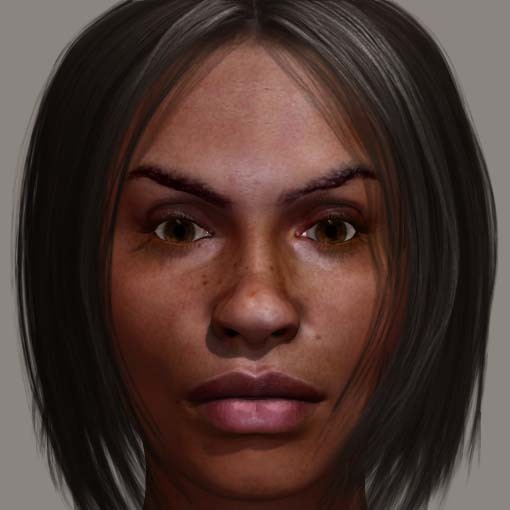 Notice a bit more graininess in the highlights of the hair in the picture rendered with the reduced render settings. You can probably detect a few more flaws in the reduced render settings image, but objectively the difference between the two doesn't seem that great to me. Just for comparison here's a render which involves texture reduction - I reduced all the maps for the hair to approximately 1/4 their size, and I set the max texture size in the render settings to 1024. Note the very obvious loss of detail. This render took aprroximately the same amount of time (give or take a minute) as the compromise render settings image without texture reduction. Here's the Koz Long Evolution comparison. Again, notice a bit more graininess in the highlights of the hair in the picture rendered with the reduced render settings. And again you can probably detect a few more flaws in the reduced render settings image, but objectively the difference between the two doesn't seem that great to me.